If soybeans can take advantage of the air’s abundant supply of nitrogen, why does corn rely solely on nitrogen available in the soil? It’s no secret that soybeans have evolved a unique relationship with rhizobia, a common soil bacteria that converts atmospheric nitrogen into a form plants can use. Yet much about this alliance is unknown. University of Nebraska-Lincoln plant scientist Marc Libault seeks to better understand soybeans and other legumes’ mutually beneficial relationship with the bacteria rhizobia. His research could help lead to improving legumes’ efficiency at assimilating atmospheric nitrogen, called nitrogen fixation, and even to transferring the capability to other crops, such as corn. Greater efficiency and expanding nitrogen fixation beyond legumes could reduce the need for costly fertilizers. “Biological nitrogen fixation is quite useful, especially in Nebraska, because it has the capability of really minimizing the use of nitrogen fertilizer,” said Libault, assistant professor of plant biology. “Overuse of fertilizers can create massive water pollution from runoff into lakes and rivers.” Excessive nutrients cause plants and algae to proliferate, choking out fish and other organisms. Although plants are surrounded by atmospheric nitrogen, a vital nutrient, they’re unable to use it directly. Rhizobia have the ability to convert nitrogen gas into ammonia, a form of nitrogen that plants can use to manufacture the molecular components they need to grow. To take advantage of rhizobia’s ability to fix nitrogen, legumes entice the bacteria to live inside, or infect, their roots, where the plants supply them with energy and other nutritional needs. In exchange, rhizobia produce ammonia stored inside nodules that develop on the roots. Other organisms, particularly certain trees, such as alders, also have evolved this symbiotic relationship with rhizobia. Libault’s research focuses on the changes that take place inside the plant to initiate a rhizobial infection. Researchers have identified a complex chain of events that plants use to control the initial stage of infection. Libault’s team is elucidating a key component: identifying a set of plant genes important to coordinating the activation and timing of gene expression in root cells in response to rhizobia. Proteins that target and bind to the genes Libault is after are known. So his team is employing a technique that uses the proteins as bait. After the proteins bind to the genes, they are able to isolate the genes from the rest of the genome and sequence their DNA. By identifying the genes, the team will be able to further investigate their role in establishing rhizobial infection. This fundamental research is an important step toward one day improving plants’ ability to enhance their nitrogen-fixing capabilities. 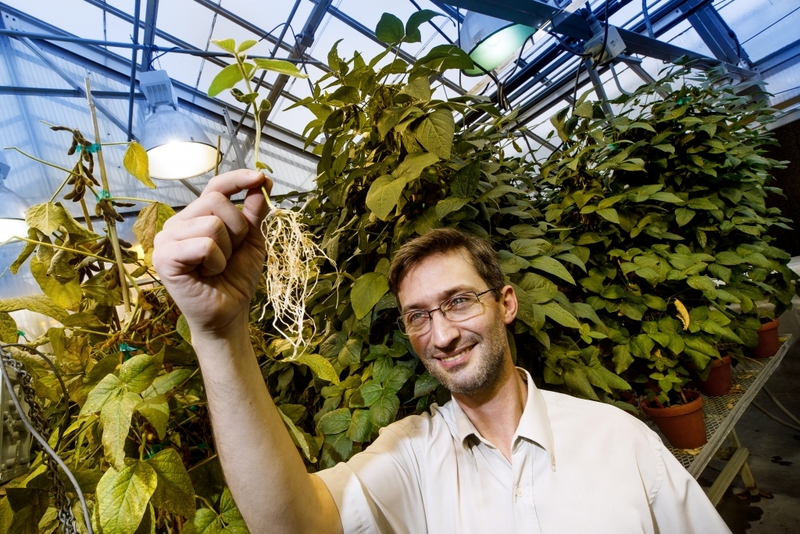 Better understanding nitrogen-fixing plants may also provide insight into how to genetically modify other crops, such as corn, to give them the ability to attract rhizobia and fix atmospheric nitrogen, Libault said. Libault’s project is funded with an $573,573 Faculty Early Career Development Program award from the National Science Foundation, the prestigious award given to outstanding pre-tenure faculty. Libault received his CAREER award as a faculty member at the University of Oklahoma and is continuing this work at Nebraska. Libault also researches how soybeans and sorghum respond to stress from increased levels of atmospheric carbon dioxide and drought, both consequences of climate change. Nebraska’s strong investment in researching crop production and plant-microbe interactions drew Libault to the university. He’s affiliated with the Center for Plant Science Innovation and the Center for Root and Rhizobiome Innovation. “The scientific environment here is really excellent,” Libault said.